The foreign policy of smaller states in the 1940s has often been characterized in terms of waiting and hesitation, or even impasse. There has also been a heavy focus on neutrality versus alliance. 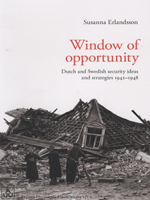 Window of opportunity;s systematic comparison of the security ideas and strategies of Sweden and the Netherlands, two countries with similar policies of neutrality before World War II but different Cold War policies, focuses attention on the choices available to small countries while at the same time it refuses any simple story of neutrality versus alliance. It makes a significant intervention into our understanding of the impact of World War II on small country politics and diplomacy in the face of the increasing polarization between the Western and Easten blocs. It shows how actions taken or contemplated during and immediately after World War II deepen our understanding of key decisions taken in the early Cold War period, and also how they illuminate several aspects of the subsequent history of both countries.